This is a review of Provillus’ Hair Growth Treatment for Men. Provillus’ claims that their Hair Growth Treatment can repair the natural effects of aging, reversing hair loss and stimulating new hair growth, by reactivation of your hair follicles. Continue this article to find out more about this supplement & find out if it’s the right product for your hair growth needs. After consulting the information provided on Provillus’ website, it is recommended that individuals apply this product their scalp, once or twice daily. It is further recommended that individuals only apply this product to areas visibly suffering from hair loss. Provillus warns that, without constant usage of their Hair Growth Treatment for Men, any additional hair growth seen from this product will eventually deteriorate. Provillus’ FAQ also suggests that individuals not exceed the recommended dosage, as this could lead to scalp damage. 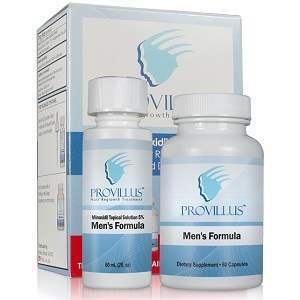 The Provillus’ Hair Growth Treatment for Men is designed specifically for males, and is not recommended for women or individuals under the age of 18. After careful research, it seems that the Hair Growth Treatment for Men contains strong enough levels of the active ingredient (Minoxidil) to have a noticeable impact on the scalp, and we found several peer-reviewed, scientific studies supporting these claims. Provillus warns to watch for any of the following side effects: chest pain, rapid heartbeat, dizziness, faintness, sudden weight gain, swelling of the hands or feet, unwanted facial hair growth, or prolonged irritation of the scalp. If any of the aforementioned side effects occur, Provillus recommends stopping the regimen immediately, and consulting with a physician. Provillus also warns against ingesting this product, as it is for external use only. If this product gets in your eyes, immediate medical attention is recommended. A single bottle of Provillus’ Hair Growth Treatment for Men costs $49.95, enough for one month’s supply. Savings are available on bulk orders, $99.90 for a 3 month supply ($49.95 in savings), and $149.85 for a 5 month supply ($99.90 in savings). Provillus advertises a full refund within 90 days of receiving your supplement, provided your product is returned in its original state, completely unused. Several reviews could be found on the Provillus web site, all of them exceptionally positive. Secondary seller sites had moderately positive reviews, with most claiming to see at least some improvement. Provillus’ Hair Growth Treatment for Men seems to be a quality product that stands out from the wealth of other treatments and supplements available today. Provillus currently has the only hair replacement product on the market that has been approved by the FDA specifically for hair loss, a strong selling point. Several positive reviews, both on Provillus’ web site and secondary seller’s web sites also contribute to this product’s positive reputation. There are, however, some negative aspects to this product. The possibility of serious side effects (not seen with traditional herbal supplements) is somewhat uncomforting. Also alarming is the obvious toxicity of this product if ingested or used inappropriately. John Brownstone	reviewed Provillus	on June 28th	 and gave it a rating of 3.